South Korea’s exports of instant noodle soup ramyeon exceeded $400 million for the first time ever last year as spicy flavored Korean quick dish won hearts of broader consumers around the world. According to data by Korea Trade Statistics Promotion Institute on Monday, Korea shipped out $413 million worth ramyeons in 2018, up 8.4 percent from a year ago period and more than doubled from 2012. Ramyeon, which used to be referred as ramen in Japanese language, has been the country’s all-time favorite quick meal. The snack has been losing ground to other instant meal options such as various types of ready-to-eat meals that have rapidly gained in popularity. Seeking to make up for the fall in domestic sales, Korean ramyeon companies have turned their eyes towards outside the country. Thanks to its spicy but addictive flavor, the popularity of Korean ramyeon products has been growing fast in overseas markets. The United States was the biggest market for Korean ramyeons with exports jumping 22.6 percent on year to $50.4 million. Japan came second with $31.7 million, up 24.6 percent on year, followed by Southeast Asian countries such as Malaysia and Indonesia that also showed a double digit growth of above 10 percent. 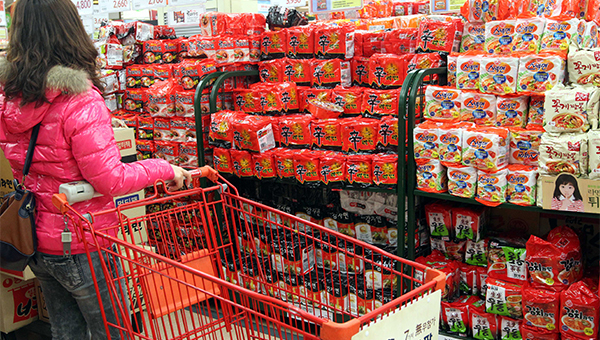 Europeans also showed growing appetite for Korean instant noodles. Ramyeon exports to the United Kingdom rose 16.1 percent on year to top $10 million last year for the first time. Shipments to Germany and Russia leapt 54 percent and 30 percent, respectively. Ramyeon exports to China, which used to be the biggest ramyeon export market to Korean instant noodle companies, however, shrank 9.6 percent on year to $93 million. Nongshim Co., Korea’s largest instant noodles manufacturer, is aggressively expanding its presence in North America, adding its products to shelves of Walmart’s nearly 4,000 outlets. Its overseas sales for full 2018 hit a record high of 860 billion won ($765 million). Ottogi Corp., another leading ramyeon brand in the country, is estimated to have registered a record high of 100 billion won in overseas sales for last year. Samyang Food Co. even set up a sales unit in Japan last year. Its super-hot chicken flavor “Buldak” series ramyeons have been selling well in the neighboring country, marking an average annual growth rate of 138 percent from 2016 to 2018, according to the company. It projected its overseas sales to rise 15 percent on year to 230 billion won this year, thanks to best-seller Buldak ramyeons.